There are plenty of cord-management options for earbuds. You can find CAT5 or Ethernet cables that retract nicely into tiny little spindles. But power-supply cords are just as unwieldy as they’ve always been. Maybe you can separate the thick AC cord from the thin DC one, and maybe you have a cute little Velcro cable tie at the end. But winding it is still a pain. When your laptop was shiny and new, you took time after shutdown to organize and bind your cords, stow each in a special pouch, and secure them carefully in your laptop case. But now your laptop’s a bit dusty, an odd assortment of crumbs line the crannies of your keyboard, and various sticky notes line the palmrests. We bet you go half-commando from time to time. Half-commando means you unplug everything that connects to your laptop when you’re ready to pack it up, that you store your laptop in a sleeve or special compartment in its case, but that you shove the cords and peripherals into your bag in a tangled mess. It’s better treatment of your machine than going commando, but it’s a heck of a lot faster than winding everything up. The eyes of half-commando laptop packer-uppers are likely to glaze over as they view most highly compartmentalized laptop-ready man bags. So many little zippered pockets! What they need is something a little more casual: a messenger bag with a notebook sleeve. Or a backpack with a laptop compartment, but plenty of space left over for cramming in a messy web of wires. 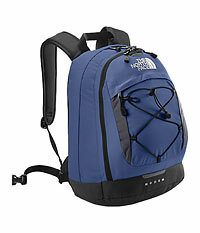 The North Face’s option for all you half-commandos out there: The Modem, a day pack with a slightly retro name. It’s similar to the Jester, but features a suspended computer sleeve in the main compartment, so you can treat your machine more gently than your cords. The Modem comes in six color combinations, and it costs the same as the Jester. There’s also a pocket in front that features a headphone port that you can thread your earbuds through. You can go half-commando but still be fussy about your headphone cords, we guess. This entry was posted on Wednesday, June 14th, 2006 at 4:53 pm	and is filed under Backpacks, Bookbags, Commentary, Laptop Bags, Man Bags, Manufacturers. You can follow any responses to this entry through the RSS 2.0 feed. You can leave a response, or trackback from your own site.